CMA CGM has just extended the duration of its PEX 2 and PEX 3 Round-the-World services from 77 days to 83 days. The PEX 2 service features two 8-berth ships, the CMA CGM Jacques Joseph and CMA CGM Lisa Marie via Mexico and the Caribbean and PEX 3, five ships via the US Gulf and Florida, of which the CMA CGM Cendrillon and CMA CGM La Scala are 7-berth ships, the CMA CGM Lamartine and CMA CGM Maupassant are 6-berth ships and the APL Scotland carries one passenger only. Since the Rickmers Round-the-World passenger service ended in 2011, this has been the only service available for a full circumnavigation by cargo ship. The five-ship PEX 3 service embarks US passengers at Houston, Mobile, New Orleans, Miami and Jacksonville before sailing for Singapore and Hong Kong, then three Chinese calls at Shekou, Ningbo and Shanghai and returning to the US via Pusan. The two PEX 2 ships pick up passengers in Ensenada and Manzanillo, Mexico, Balboa and Punta Manzanillo, Panama, and Cartagena and Kingston in the Caribbean before sailing to Singapore, Shekou, Hong Kong, Kaohsiung, Ningbo, Shangai, Qingdao and Pusan and crossing the Pacific back to Mexico. The Mexican Port of Ensenada is close enough to San Diego that it is useful for US passengers. Fares on both Round-the-World services are €130 per person per day double or €150 per day for a single traveller, with port costs and deviation insurance included. In addition, there is a booking fee of €70 and a management fee of €45 per person. Note: Special reduced fares for the full round voyage are €7,700 per person in double occupancy and €9,000 for a single passenger, about a 28% reduction. Occasionally, depending on ship changes, we have been able to offer full world voyages from Houston, Mobile, New Orleans, Miami and Jacksonville. Because of changes in the way the Pacific Express 3 Line operated it became a full 77-day Round-the-World freighter cruise from US ports via Singapore, Hong Kong, Chinese ports and South Korea. Vessels engaged on this route presently include the CMA CGM Lamartine as well as the Chicago and Conti Basel, which are chartered from NSB. The full round-the-world voyage takes 77 days, with a fare of €8,585 per person double occupancy or €9,355 for sole use of a double cabin. Sample one-way fares are Miami to Hong Kong in 39 days at €4,405 (€3,595 single), Hong Kong to Houston in 31 days at €3,525 (€3,835 single) or Houston to Singapore in 42 days at €4,735 (€5,155 single). The full itinerary is Houston – Mobile – New Orleans – Miami – Jacksonville – Tangier – Singapore – Hong Kong – Shekou, China – Shanghai, China – Ningbo, China – Pusan, South Korea – Houston. 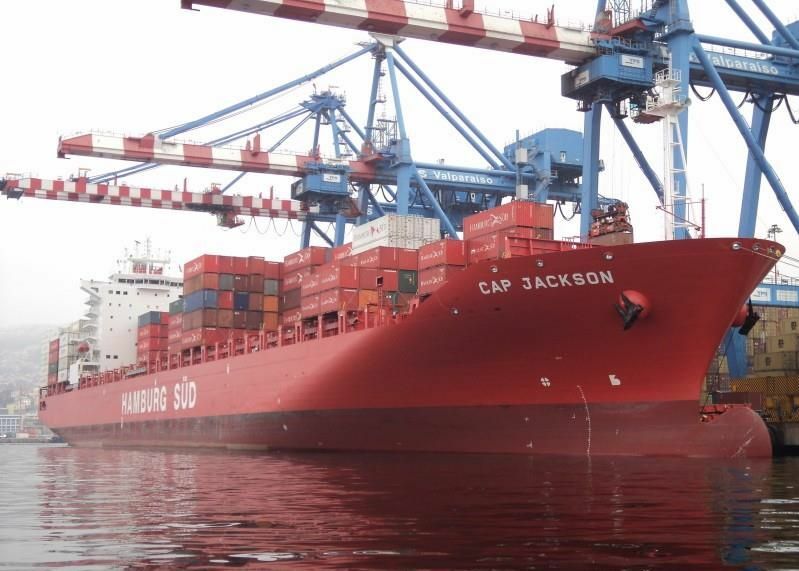 Update 01.11.14: Hamburg-Süd’s 50,270-ton deadweight container ship Cap Jackson has been assigned to a new cargo-passenger route between Genoa, Fos-sur-Mer, Barcelona and Valencia, by way of Cartagena and the Panama Canal, to Manzanillo, Los Angeles, Oakland, Tacoma and Vancouver. She then returns from Vancouver via Portland, Oakland, Los Angeles and Manzanillo, by way of Panama again, Cartagena and Caucedo, to Lisbon, Tangier, Valencia, Cagliari, Livorno and Genoa. The round voyage takes 77 days while the voyage from Barcelona to Vancouver is 34 days and Vancouver back to Genoa is 40 days. Built in 2010, and sailing from Barcelona this morning (01.11.14) on her way to Vancouver, the Cap Jackson has two single cabins. Fares begin at €6,850 for the round voyage (€7,235 in the Owners single), and €3,195 for the one-way trip from Barcelona to Vancouver (€3,365 in the Owners). Air-conditioned with elevator, both cabins have views to the side of the ship (so no container stow in the way) and age limits are 6 to 79 maximum. This voyage can also be turned into part of a round-the-world routing by linking up with CMA CGM’s Columbus Loop service to the Far East and New York via Suez. For further details please call Miri Lopusna at The Cruise People Ltd in London on +44 (0)20 7723 2450 or e-mail cruise@cruisepeople.co.uk. Ask about round-the-world cruises as well. At this time a century ago, Glasgow’s Allan Line, a very innovative company that was among the first to stretch many of its passenger liners by adding new midsections in the 19th Century, was preparing to introduce two new trend-setting ships to the North Atlantic in 1914. The first of these, the 18,481-ton Alsatian, was built by William Beardmore & Sons in Glasgow, while the 17,515-ton Calgarian was completed by the Fairfield Shipbuilding & Engineering Co Ltd of nearby Govan. That summer, with the onset of the Great War, both ships were requisitioned by the Royal Navy for use as armed merchant cruisers. Regrettably, the Calgarian was sunk by a U-Boat off the cost of Northern Ireland on March 1, 1918. This ship had been at the scene of the Halifax Explosion on December 6, 1917, when her crew had assisted in the rescue and medical relief after the French ship Mont Blanc, loaded with explosives, and the Norwegian Imo were in collision in the harbour. More than 2,000 people died in the resulting explosion. 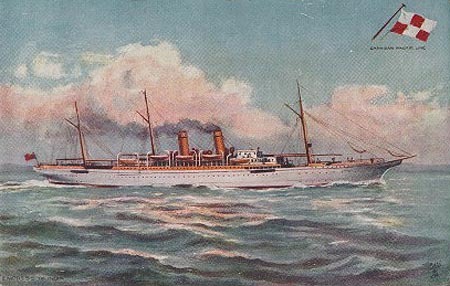 During the conflict, the Allan Line was taken over by Canadian Pacific and in 1919 the Alsatian was refitted as an Atlantic Empress, taking on the new name of Empress of France. Her maiden voyage as an Empress left Liverpool on September 26, 1919, for Quebec. In 1923, she became one of four ships to circumnavigate the world from New York, following Cunard Line’s 19,695-ton Laconia by only a few weeks. The Empress of France made a number of world cruises in the 1920s, as did her fleetmate, the 24,581-ton Empress of Scotland. As well as seeing the Pacific on her world cruises, the Empress of France spent a year in the Trans-Pacific trade when in October 1928, she sailed from Southampton for Suez, Hong Kong and Vancouver (where she is seen above in this Walter E Frost photo). 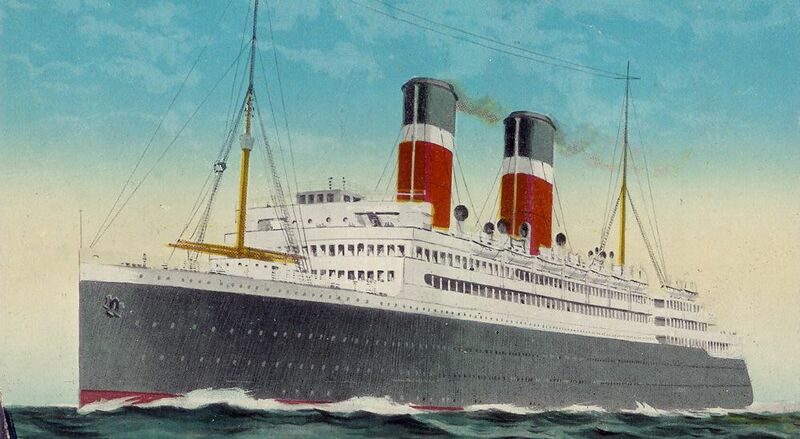 There, she substituted for the 1922-built 21,517-ton Empress of Canada, first of the name, which was sent to Fairfield’s to be re-engined for more speed. 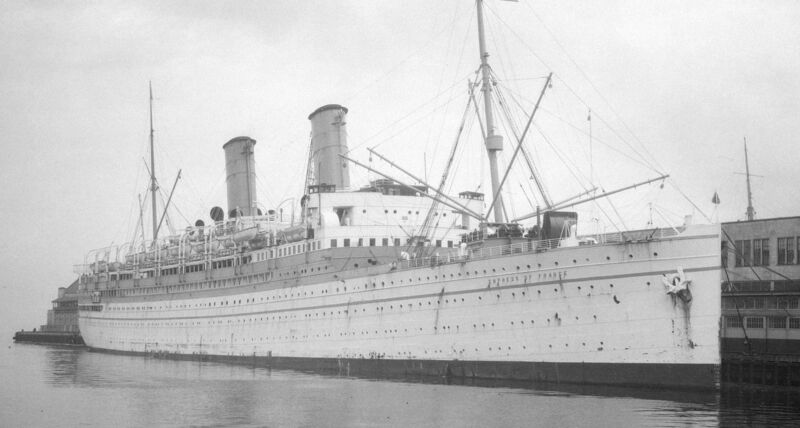 The Empress of France sailed Trans-Pacific until October 1929, when she left Hong Kong again for Liverpool. In September 1931, Empress of France made her final voyage from Southampton to Cherbourg and Quebec. Having been displaced by the new 42,348-ton Empress of Britain, she was laid up in the Clyde and finally scrapped at Dalmuir, where she had been built, three years later. In all, the first Empress of France had a career that spanned twenty years, which in addition to her war service included ninety-nine Trans-Atlantic voyages, five Trans-Pacific voyages, and eight cruises. The Cruise Examiner for 30th December 2013.. The year 2013 has seen the arrival of the best new ship to join the world cruise fleet in some time, one that immediately achieved the top score in the Berlitz Complete Guide to Cruising & Cruise Ships. 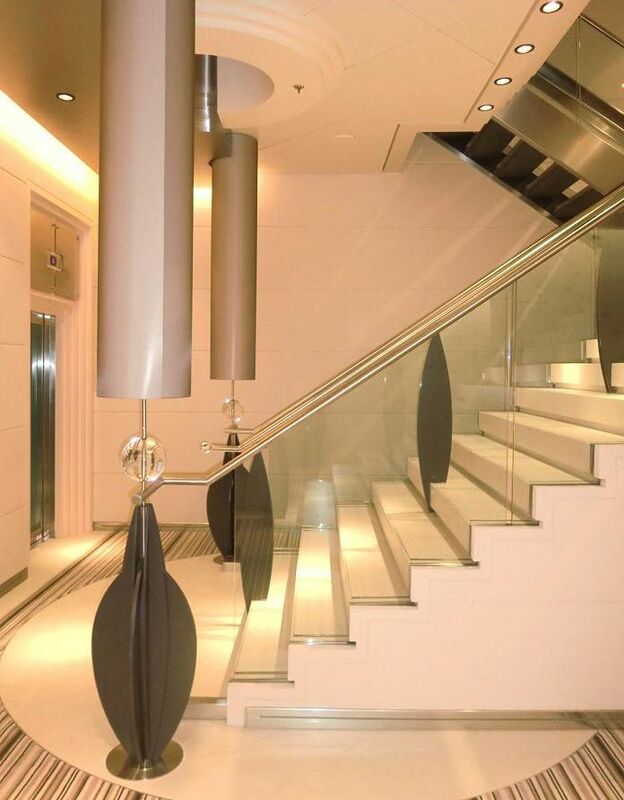 This week we therefore bring you a brief photo essay of the Europa 2, taken on one of this year’s pre- inaugural cruises from Southampton (see one of her stairwells on the right). Elsewhere, we look at recent changes in the world of expedition cruising with the Sea Explorer and Sea Spirit. We also have a historical look at the introduction of the Allan Line’s turbine-powered cruiser-stern Alsatian one hundred years ago next month. This ship became Canadian Pacific’s Empress of France in 1919 and one of the first ships to offer a full world cruise in 1923. The Cruise Examiner for 2nd December 2013..
Royal Caribbean has announced that it will base its second 167,800-ton “Quantum” class cruise ship Anthem of the Seas in the UK from 2015. She will be a fifth larger than P&O Cruises’ new 141,000-ton flagship Britannia, due to debut in the same year. She is Royal Caribbean’s contribution to the head-on-head battle for supremacy in the UK market from Southampton between Royal Caribbean and its Celebrity brand, on the one hand, and Carnival UK, with its P&O and Cunard brands, on the other. 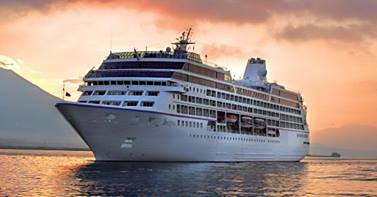 Elsewhere, Oceania Cruises has now scheduled two 180-day world cruises for its 30,277-ton Insignia (above), making her a year-round world cruiser. And we have a quick look at what’s happening on P&O Cruises’ blog. Contrary to what most sources say, world cruising did not start with Cunard Line’s Laconia in 1922, but actually got its start way back in 1891 when Canadian Pacific took delivery of the first of three new Empresses, the 5,920-ton Empress of India. Built at Barrow-in-Furness, in the shipyard where BAE Systems is to-day building seven “Astute” class nuclear-powered fleet submarines for the Royal Navy, the Empress of India was launched on August 30, 1890. After fitting out, she departed Liverpool on Sunday, February 8, 1891, on Canadian Pacific’s first world cruise, one in which it offered a voyage in the Empress of India from Liverpool via the Suez and Hong Kong to Vancouver, a journey across Canada on its famous trans-continental railway and a Transatlantic liner crossing back to Liverpool. On Tuesday, April 28, 1891, after a voyage of 79 days, the Empress of India thus became the first White Empress to arrive at Vancouver, whereupon her world cruise passengers continued their journey across Canada and the Atlantic Ocean to complete their trip around the world. Within less than six months, Canadian Pacific offered two more such cruises, with Empress of Japan leaving Liverpool on April 11, 1891, and the last of the trio, Empress of China, sailing from Liverpool on July 15. These ships, the first twin-screw liners on the Pacific, had been ordered by Canadian Pacific to fulfil a new mail contract that connected the UK and Hong Kong by way of its recently-completed transcontinental railway, over which the first train had run between Montreal and Port Moody in July 1886, with the line reaching Vancouver in May 1887. While these were really positioning voyages to get the new ships from Liverpool to Vancouver, this was not the end of the story for Canadian Pacific. More world cruises would follow when new ships were ordered for its Transpacific service and in the 1920s and 1930s, Canadian Pacific would become one of the best-known names in world cruising, with several of its Empresses offering world cruises, and most particularly the 42,348–ton Empress of Britain (ii) of 1931, the first ship to be designed to cross the North Atlantic by summer and offer a world cruise every winter. Three famous Cunard ships would later follow this pattern, including the 34,274–ton Caronia of 1949, the 65,863-ton Queen Elizabeth 2 of 1969 and the 148.528-ton Queen Mary 2 of 2003, which is celebrating ten years of service this year. 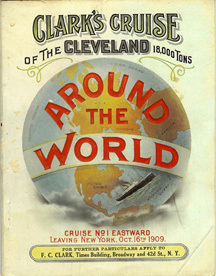 After the delivery voyages of Canadian Pacific’s Empresses, the next stage in world cruising occurred in 1909, when a new world cruise routing was offered by Frank C Clark of New York, an early organizer of cruises, who chartered Hamburg America Line’s 16.960-ton Cleveland to offer two world cruises five years before the Panama Canal was opened. The Cleveland left New York on October 16, 1909, and took 108 days to proceed across the Atlantic to ports in the Mediterranean, Suez Canal, India and the Far East before finishing her world cruise in San Francisco on January 31, 1910. Passengers then returned to their homes from the West Coast by train while the Cleveland operated a second world cruise in the opposite direction, returning from San Francisco to New York by way of Suez. More ships soon followed on similar routings. Cunard Line’s claim that its 19,680-ton Laconia made the first world cruise in 1922-23 is correct only insofar as this was the first complete circumnavigation of the world by a cruise ship, something that obviously could not be done before the Panama Canal opened in 1914. The first full circumnavigation by Laconia thus left New York in November 1922, took 130 days and called at twenty-two ports on her way around the world. In fact, world cruises boomed in 1922-23, with the Laconia being only the first of four ships to leave New York on world cruises that winter. 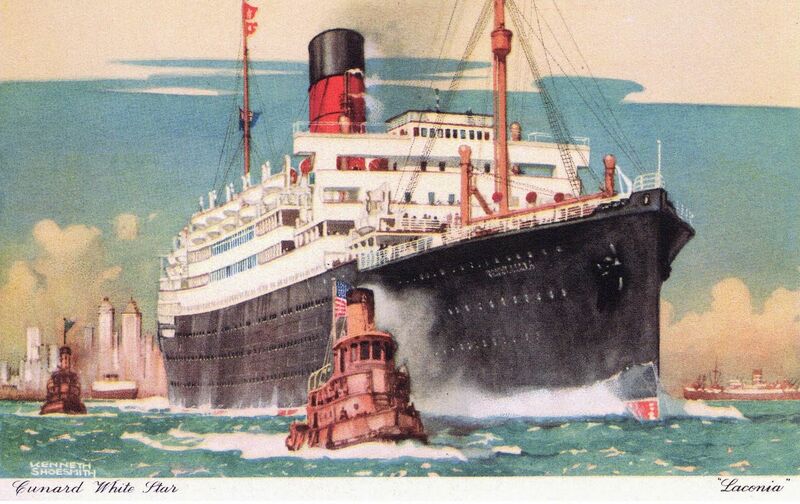 The others, booked either by Frank C Clark or by American Express, were United American Line’s 19,653-ton Resolute, Canadian Pacific’s 18,481-ton Empress of France and Cunard Line’s 19,602-ton Samaria, which sailed in the opposite direction from the other three, proceeding from west to east. The rest, as they say, is history. Considering a modern-day World Cruise? With offices in Europe and North America we are perfectly suited to booking your trip of a lifetime. Start your journey now by calling The Cruise People Ltd in London, England, on 020 7723 2450 or by e-mailing us at cruise@cruisepeople.co.uk.